Think you know Resonance structures? Test your knowledge with my Resonance Structures Practice Quiz! Practice is ESSENTIAL to mastering Organic Chemistry. You have to be able to apply the skills you are learning. First, complete the Resonance Structures Practice Quiz, and then watch this video where I go over the first three question solutions and explanations step-by-step! 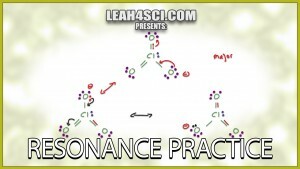 This is Video 6 in the Resonance Structures Video Series. Click HERE for the entire series! Ready to test your resonance skills? Try my FREE Resonance Practice Quiz. Always had problems with this stuff, hope by the end will get something out of it. I hope so too! It takes work, but it’s worth it!